Hypertext or print, it's all about science fiction. Looking for educational materials? Over on the edu page. Interactive science fiction short scheduled to appear in Cream City Review and its online companion, I/O in Spring, 2019..
An 8,800-worder that appeared on the cover of the Jan/Feb 2012 issue of Fantasy & Science Fiction. Not entirely sure whether it's my first fantasy story, secret history, magic realism, or hard sf. You can read it online or download as rich text here. 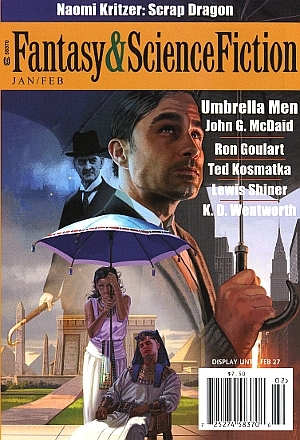 The January 2005 issue of Fantasy & Science Fiction featured a novelette, Keyboard Practice, consisting of an Aria with diverse Variations for the Harpsichord with two Manuals. Set in a near-future with ubiquitous podcasting, the story chronicles a classical piano competition and borrows structural elements from from Bach's Goldberg Variations and American Idol. Oh, and there's an artificially intelligent piano, a canon, an NTSB transcript, and maybe — just maybe — a ghost. This story was a finalst for the Sturgeon Award, appeared on the 2005 preliminary Nebula® ballot, and was a Locus Magazine recommended read. Read it online here. You can read an interview with me on SciFiChannel.com: 'Keyboard' Channels Bach. Drawing on the work of media theorists Marshall McLuhan, Robert Logan, and Elizabeth Eisenstein, Ashbazu explores what might have happened if the printing press were invented somewhat earlier than 1456. 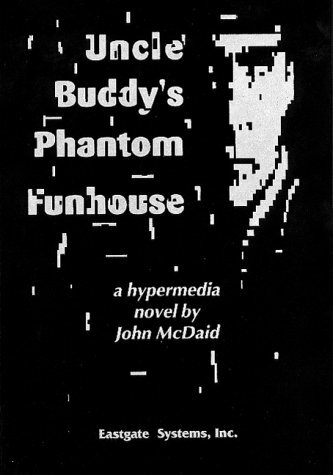 One of the earliest hypertext novels published by Eastgate Systems, the Funhouse was a finalist for the 1993 NewMedia INVISION Award. Read the New York Times Review (8/29/93) by Robert Coover. There is a version available on the Internet Archive. This is an amazing review, 25 years after publication, in The Obscuritory. And here's my favorite non-review "review" of the Funhouse by a reader who came to it without any of the background, and...well, read for yourself. You can download a press kit. Here's some google results where you can find some of the commentary and criticism. Originally written as a series of lexia to be included in a collaborative hypertext in a special issue of the journal Writing On the Edge, the story is available on-line in a compilation of early hyperfictions.